By Scott Gilfoid: Deontay Wilder is so upset with promoter Eddie Hearn that he plans on making an example out of Anthony Joshua when/if they fight each other this year. WBC heavyweight champion Wilder (40-0, 39 KOs) says he’s going to pretend Hearn’s head is on the body of Joshua (21-0, 20 KOs), and he’s going to batter him. Wilder thinks Joshua made a mistake in not agreeing to the guaranteed $50 million that was offered to him by his management for the fight. Wilder, 6’7,” has been in contact with Joshua during the negotiations. Wilder is very unhappy with his experience with Hearn in the negotiation process. Starting with the tiny $12.5 million flat fee Hearn offered to Wilder to the rejection of the $50 million guaranteed offer for Joshua, it’s been a major negative for Deontay. “Eddie [Hearn] is a manipulator, contradictor and compulsive liar,” Wilder said to BehindTheGloves. ”If anybody can’t identify a snake, that’s the one you practice on. All the things they’ve put me through, I can’t wait. I’m going to take Eddie’s head and stick it on Joshua’s body,” Wilder said. Wow, Wilder is really letting Hearn have it, isn’t he? I guess he’s had too much contact with Hearn and he now is officially fed up with him. It’s interesting to see how difficult this entire process has been for Wilder in trying to get Hearn to put the fight together. Oh well, at least Wilder knows now what he’s up against in trying to get a fight against Joshua. When promoters want to put fights together, they don’t present roadblocks and offer tiny flat fee offers like we saw with the 90-10 offer given to Deontay for the Joshua fight. Well, I do think Wilder will eventually get the chance to KO Joshua at some point in the future, but I doubt that it’ll happen this year. Joshua is still bringing in too much money to Hearn’s Matchroom Boxing stable. If Wilder knocks Joshua out cold, the gravy train could come to an end. I don’t think there’s going to be a fight between the two for the time being, even though Hearn has been going on endlessly about wanting to make the Joshua-Wilder fight. Of course, actions speak louder than words. If Hearn really wants Joshua to fight Wilder, he wouldn’t be dragging his feet the way he’s been doing for the past two years. I believe that Wilder is no closer to getting the fight against Joshua than he ever was. 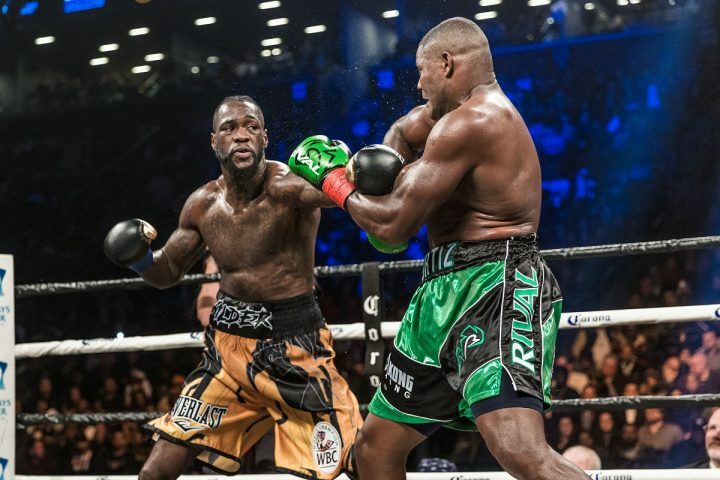 “It’s clear to see that they don’t wanna fight me,” Wilder said. “Every time they come with something, I’ve agreed to everything. They haven’t agreed to nothing. If he fights (Anthony) Povetkin, then he’s completely ducked,” Wilder said. So, there it is. If Joshua faces Povetkin next, then he’s completely ducked Deontay. I can’t say I’ll be surprised. I never thought for a second that Joshua and Hearn fancied the idea of fighting a talent like Deontay. What many boxing fans believe is Hearn isn’t truly interested in matching Joshua against Wilder in 2018. They think Hearn only wants Joshua to face his WBA mandatory challenger Alexander Povetkin. Wilder is just being strung along with no real intention of Joshua facing him.